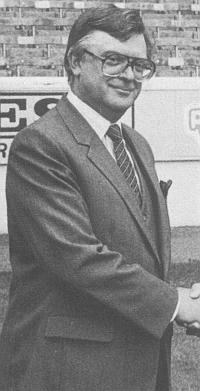 The Clarets were looking to build on the improved 1990/91 season with promotion out of the fourth division the clear target for 1991/92, but they felt they were being undermined by comments that were being made within council meetings which led to a major row between councillor Brooks and the club. The row erupted initially at a meeting of the council's Policy and Resources Committee when Brooks, an arch-critic of the club, hit out at the agreement to underwrite the screening of the play off game against Torquay to the tune of £1,500. He questioned the use of savings from other areas of public expenditure to guarantee losses at the Turf Moor screening. Brooks said: "At the club's last AGM, the board of directors refused to give details of how its shop was being run by a private company. The directors enjoy considerable privileges, and until those are pruned to the bone they should not come cap-in-hand to the council." It came as no surprise that the support Brooks received was from fellow councillor, and keen Blackburn Rovers supporter, Gordon Birtwistle, who added: "The football club was a private limited company and it had been wrong to give it £1,500 when it was already charging the public a considerable amount of money to stage the screening. Poll tax payers could be aggrieved." In response, councillor Mike Cooney said that it was the council's avowed policy to support industry and that the football club was an industry that did more for the town than any other organisation. Councillor Peter Kenyon confirmed that none of the £1,500 'gate' guarantee had yet been called on by the football club, and that the decision to provide it had been made at an emergency meeting of the chairmen of three committees. If it had not been provided, he added, the screening might not have gone ahead causing problems as fans tried to get to Torquay. Brooks was having none of it and described that as nonsense. He then said: "This July, between £10,000 and £15,000 will be spent on a trip to Russia in which people not essential to the club will be going at the club's expense. A decision like this should have been taken through the committee system." "So it was," said councillor Cooney, "And I take exception to that remark as the decision was taken as objectively as possible given the merits of the case." He added: "There's something going on here that smells. If someone here has an axe to grind with Burnley Football Club." When Brooks retorted with: "I resent that," the discussion was immediately wound up by councillor Ken McGeorge. In a full council meeting, he went for the club again. Replying to a comment from councillor Richard Robinson, Brooks said: "I am slightly surprised that councillor Robinson should speak so strongly in the defence of a board of directors who have kept Burnley Football Club in the fourth division for seven long years. "I stand by what I said. Burnley FC, a great institution, is going nowhere under the present regime and the supporters are getting a harsh and scurvy deal from the directors." Clearly the football club had just about had enough of the rantings of Harry Brooks by now and in an almost unprecedented move since the days of Bob Lord they reacted, and reacted very strongly to the accusations from him. A statement from the club, via chairman Teasdale, was published in full in the Burnley Express. It outlined the background to the Torquay game screening and accused Brooks of wanting things both ways. It confirmed that details of the shop, as Brooks knew full well, were given at the AGM. It labelled the costs of the Russian trip as nonsense, outlining that the club had been invited, it was being sponsored by Endsleigh and any directors going would be doing so at their own expense. Finally, it hit out at accusations of directors getting perks and read: "Let me make it absolutely clear that the directors of Burnley Football Club do not treat themselves any differently to the directors of other fourth division football clubs. "They frequently pay for many things out of their own pockets which the club could quite properly be expected to pay. Mr Brooks has conveniently forgotten the number of times that he has been provided, free of charge, with complimentary tickets for away matches at grounds throughout the country. It didn't seem to bother him then." The hard hitting statement ended: "My colleagues on the board at Burnley Football Club, our management and playing staff, are all prepared to accept fair and constructive criticism. That follows from the public profile of Burnley Football Club. "What we are no longer prepared to tolerate or accept is criticism from this particular individual which, in this instance, is neither fair nor constructive, and in our view represents an abuse of the privilege afforded to him as an elected member of the local authority. "We hope that in the future he will concentrate his efforts on representing the wishes and views of those whom he was elected to represent rather than using the council as a platform for his continued attacks on Burnley Football Club." Meanwhile, on the playing side, Jimmy Mullen said, in Frank Casper's absence, that things were progressing well and that he'd spoken to three players with regard to moving to Burnley. On the contract rebels, he confirmed that there had still been no offer from Wolves for Steve Davis and that there had been no interest shown in Ian Measham by any other club.